Chris Eames transports the entertainment world so the entertainers can transport you. We have experienced on-site staff at exhibitions across Europe. We get your Show on the road that’s what we are about. 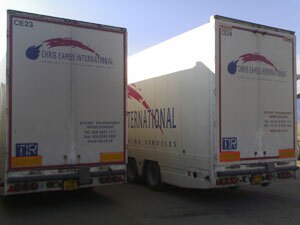 Chris Eames International started out in music more than 30 years ago, when the company supplied trucking services for Alan Price’s UK tour in 1979. Since that time, CEI has expanded to meet the uncompromising transport and logistics needs of the entertainments and events industries around the world. In 1983, we delivered our first fully integrated logistics service for all the major film and music festivals in Cannes. In 2004, we moved from Bow in East London to larger facilities in Barking, to consolidate trucking with air and sea freight operations. Over the years – and in response to what can be very unusual or highly specialized requirements – we have developed a range of services that deliver reliable, accountable support for global corporations, independent production companies, stand builders and event organisers. The same care and expertise are central to our touring services for the music industry, where we also provide a range of support functions. As well as our Barking Depot, we have staff, offices and secure storage facilities in London and Cannes – so that our clients always have access to knowledgeable, on-the-ground support. Wherever and whenever they need it.